I know, I've been covering Penguin like a crazy clown but we only really covered how some are seeing Penguin recoveries. When there are ups in rankings, someone else's rankings need to go down - that is just logical - there is only one site that can rank in the number one organic spot. 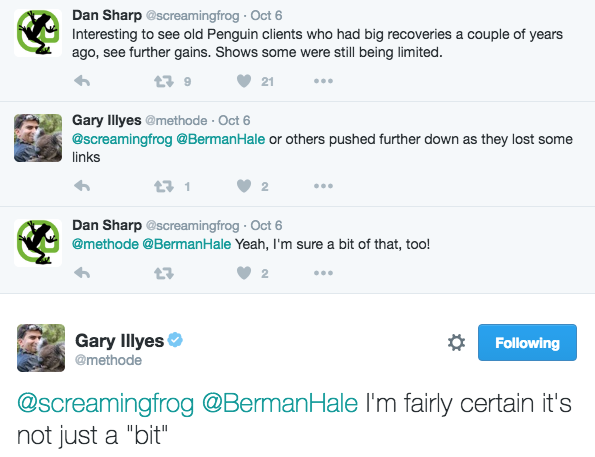 Gary Illyes from Google implied in a set of tweets that it is quiet a few sites that saw their links devalued, when they were not demoted before, that probably took a hit in the Google rankings. You can find this on Twitter where he said in response to link devaluations. You can see, he expects the drop on some rankings to be a "bit" more than a little significant.